Dr. Alexandra Khaimov (Maspeth) - Book Appointment Online! DR. ALEXANDRA KHAIMOV I truly believe that dentistry is an art that can improve your smile and make you feel good about yourself. I love the collaboration of technology & cosmetic dentistry, so I spend extensive time outside of work exploring the latest advancements within the field of cosmetic dentistry. 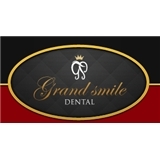 You and your family’s oral care comes first at Grand Smile Dental. Cras eu est eros, ac feugiat metus. Donec eu tellus id dui sodales commodo quis et risus. Aliquam volutpat felis ut odio varius tincidunt. This appointment was for my 8 1/2 year old daughter who is very leery of dentists and doctors but Dr. Khaimov and her staff are always so wonderful with her. Even though my daughter cries, they stop, talk to her and help calm her down while also explaining what will be done next so that my daughter will not be so scared. Every visit ends with my daughter feeling relieved and happy that she has such a wonderful dentist who takes good care of her and her teeth.